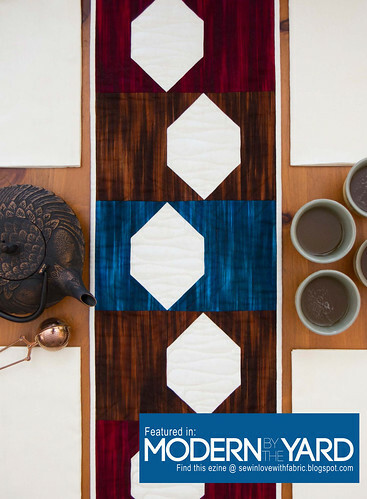 It is my pleasure to share my latest quilt pattern for Modern By the Yard, the free quarterly e-zine by Benartex. I choose a Fall palette with a pop, featuring azure, chestnut, and wine, to make the easy five block table runner featuring their Fleurish fabric line. My design features irregular hexagon beads on panels of color. (Be sure to check out the magazine for a reverse view as well.) Fall Fleurish is a beginner friendly, super fast sew, featuring HSTs and rectangles. The table runner is quilted with echo walking foot lines and the beads are free motion quilted with a ribbon candy motif. Please share pictures with me if you make one. 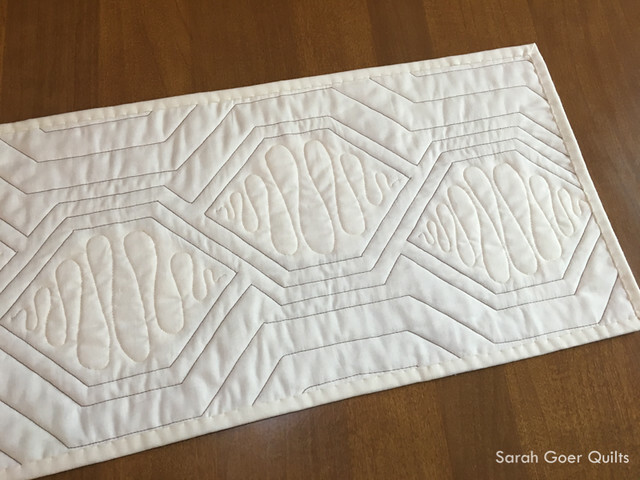 You can use #sarahgoerquilts on social media. 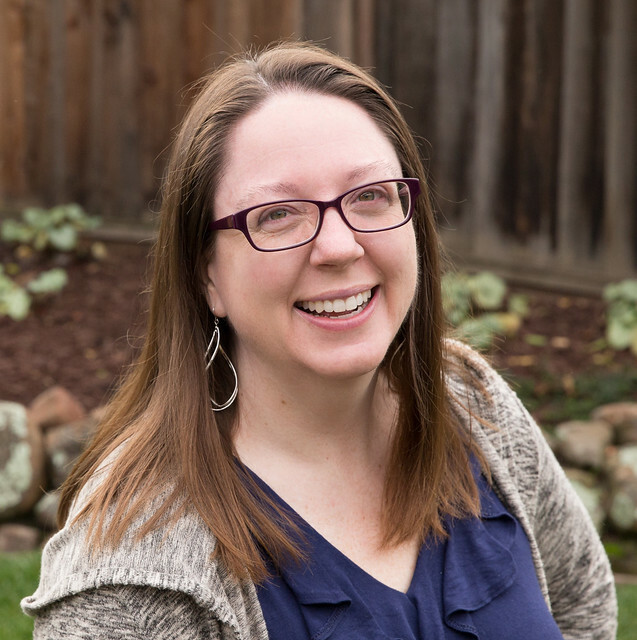 Check out my pattern from Issue #5 of Modern By the Yard, Summer Splash. I hope you enjoy this issue of Modern by the Yard. Head over the Sew in Love with Fabric for previews of all the projects and a link to the full issue which you can view online or download as a PDF. 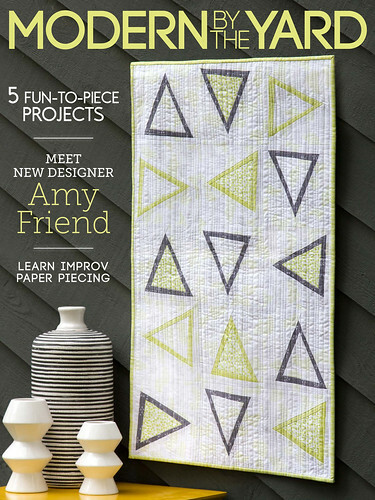 This beautiful cover quilt is designed by Amy Friend of During Quiet Time featuring her Improv fabric and Improv Paper Piecing technique. Posted in Quilting. Tags: Fall quilt, finished quilt, quilt pattern, table runner on September 25, 2017 by sarah. What a great table runner! I like the fall colors with a pop and the quilting patterns. Thank you, Sarah. I enjoyed the combination of walking footing free motion on this project. Great design, congrats on the publication! Congratulations! 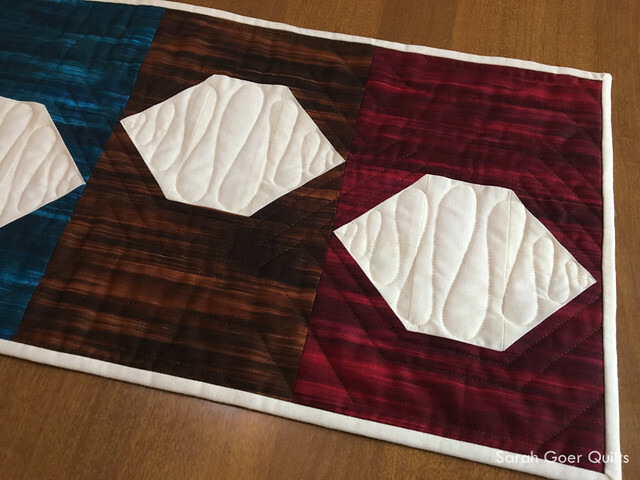 It's a great pattern, with great quilting.